Most books about the Tudors start with Henry VII firmly on the throne, focus on his son Henry VIII and his granddaughter Elizabeth I, and briefly mention the sovereigns in between. Not this one. Tudor: The Family History is really a throughout history of the family. De Lisle begins at the beginning, with Owen Tudor, whose marriage to Catherine of Valois gave the family a thin claim to the throne of England. Then, De Lisle goes on to discuss the War of the Roses and how Henry Tudor conquered his crown. It is impossible to understand the Tudors and the decisions, right and wrong, they all made, De Lisle wisely argues, without understanding their, and their country, past. As the author points out, we tend to judge the Tudor monarchs based on how their decisions affected the future, but they themselves, in making those choices, were highly influenced by the past and the war that had torn their country apart. The author also discusses all the subsequent Tudor monarchs, as well as the lesser known members of their family, including Margaret Beaufort, Margaret Tudor, Margaret Douglas, and Katherine and Mary Grey. Usually footnotes in history books, their stories are fascinating and deserve to be told. Here, they are. Rather than on battles, wars and the religious turmoil of the age, the focus of the book is mainly on the personal lives of the characters, the challenges they faced and how they dealt with them. All this information is condensed in (only!) 400 pages. But if you think that De Lisle had to let out important events and details to achieve such a feat, you’re highly mistaken. The book is very throughout and detailed, and, while telling the Tudor story, De Lisle also finds the space to dispell common myths about the family and provide new insights into the Princes in the Tower, the fall of Anne Boleyn and many other occurences. The author does have a gift for brevity, but never compromises accurancy to achieve it. Fully referenced, the book also features, at the end, five appendinces that debunk myths such as Frances Brandon’s reputation as a child abuser and the cold relationship between Jane Grey and her husband Guilford. But that’s not all. The book also contains illustrations, family trees and maps of England and France at the time. All written in a higly engaging and understandable writing style that makes the book flow easily and impossible to put down. The book discusses so many characters, which could easily have made the story very confusing for readers, especially since Tudor figures were known by different titles throughout their lifetimes, and often shared the same names. Knowing this, De Lisle has, for the first and only time, sacrificed accurancy for simplicity by picking a title for each character to identify him/her throughout the book. Well-researched and highly entertaining, Tudor: The Family History is a balanced biography of one of the most interesting royal families in history, providing a fresh look on the dynasty and their actions. It’s one of the few Tudor books out at the moment that really has something new to say about this fascinating subject, but also offers a great introduction to the Tudor period to those who aren’t familiar with it. Highly recommended. 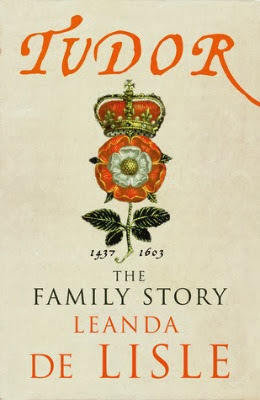 Tudor The Family History by Leanda De Lisle is an accurate, well-researched and throughout biography of all the members, including the lesser known ones, of the Tudor family. The author dispells myths on the Tudors and provides fresh insights on their actions in an entertaining and understandable way that makes the book a must read for experts and newbies alike.